Backing up to external drives. Backup to a single networked or locally connected USB or FireWire external drive. Backup to multiple networked or locally connected USB or FireWire external drives to facilitate on-site / off-site backups. 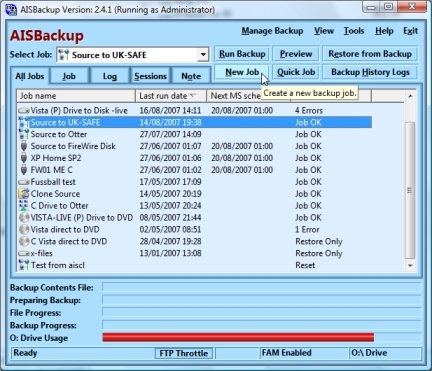 An AISBackup backup job supports to up to three external drives where each drive holds its own unique copy of the backup, i.e. instead of creating 3 separate backup jobs to three different external drives it is possible to set-up one backup job to 3 different external drives. Using this style of backup is suitable for making on-site / off-site backups of data, for example, simply connect one of the external drives for this period then switch the drive with second or third drive for period 2. There is no need to change the backup job itself as the next backup session is based on the backup found on the connected external drive and not the last backup actually run. What happens if both external drives are connected at the same time? AISBackup will ask which drive to backup to, unless the PC is unattended, then it backs up the external drive holding the oldest backup session. Does this work over a network? Yes, this is explained below. Preparing the external drives, including network sharing. Setting up the backup job to either local or networked external drives. Format each drive and ensure that each is given a unique volume label, e.g. BACKUP01, BACKUP02 and BACKUP03. On each drive create a folder called, for example, Backups. If the backup is to be made available over a network share each folder Backups using a unique name for the share, e.g. the volume name may be used as the share name. It is very important to set the permissions to everybody full access, however, experienced network administrators may wish to fine tune permissions to specific network user accounts, the only constraint is that if the folder is a backup destination then the user must have read, write and delete access to the share. The network share may point to any physical networked device, for example: A networked external drive, a networded fixed drive, a NAS drive, a LAN Disk drive. Setting up the backup job. To use this tutorial open up a copy of AISBackup and follow the instructions, click Next to move to the next step or Previous to move to the preceding step. From the AISBackup main form click New Job.